We are Colorado's Premier Dog Boarding, Dog Daycare and Dog Grooming Facility. 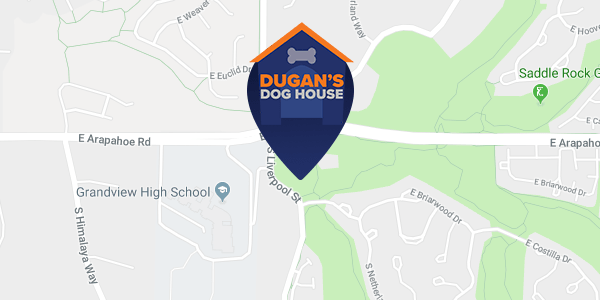 Dugan's Dog House is the Aurora, CO area's premier facility for Dog Boarding providing your pet with the highest quality care and accommodations. Call us to schedule a reservation! The Dog Daycare program here at Dugan's Dog House is uniquely designed to give your dog ample fun and exercise, combined with the security and familiarity of being in his or her backyard! Whether it is a bath and brush or a one of our premium grooming packages, our professional groomers here at Dugan's Dog House will make sure your pet looks and feels great! Dugan's Dog House is conveniently located next to Grandview High School at 6830 S. Liverpool St., Ste D in Aurora, CO just south of the intersection of E. Arapahoe Rd and S. Liverpool St.
We are a luxury dog boarding and doggie daycare provider in Aurora, CO. With unrestricted check-in and check-out times during lobby hours, dropping off your dog is quick and easy! We even have a wonderful complimentary coffee bar for our parents! We conveniently provide curbside service in front of our lobby. We are a luxury doggie daycare and service shop. With unrestricted check-in and check-out times during lobby hours, dropping off your dog is quick and easy! We even have a wonderful complimentary coffee bar for our parents! We conveniently provide curbside service in front of our lobby.